WASHINGTON — As the liberal media scares Americans with news of Ebola, Senate Democrats are fighting for their political lives in several races across the country. 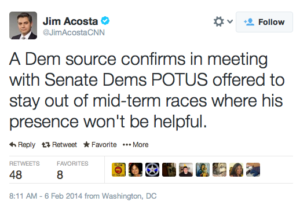 As the following tweet shows (from back in February of this year), Democrats do not want Obama to campaign for them. RealClearPolitics has taken averages of polls and found a majority of states going red, or going to Republican hands this Election Day. The GOP needs 6 seats to retake the Senate majority, which could completely remake the last two years of Barack Obama’s presidency. Bill Cassidy, the Louisiana Republican running against incumbent Democrat Mary Landrieu, has a 7-point advantage according to one average (and is only down 1% in another poll), while Mark Pryor is running behind Republican challenger Tom Cotton in Arkansas by 2%. Mike Rounds, former South Dakota GOP governor, is up 9 points on his Democratic challenger Rick Weiland, while Georgia’s Senate battle shows David Perdue up 9 points on Democratic challenger Michelle Nunn. Senate Minority Leader Mitch McConnell is up at least 6 points on challenger Alison Lundergan-Grimes in Kentucky. In North Carolina, it is a dead heat between incumbent Democrat Kay Hagan and the state speaker Thom Tillis. Republican Cory Gardner is up 6 points in Colorado over incumbent Mark Udall in one poll, or is down just one point in another. For Kansans, it is also a virtual tie between Republican Pat Roberts and independent Greg Orman (but Orman is backed by Democratic causes and supporters). In Iowa, newcomer Joni Ernst is running slightly ahead of Bruce Braley, a Democrat and former trial lawyer, by 3 points in some polls. New Hampshire and Michigan are not as competitive, with Democrats Jeanne Shaheen and Gary Peters holding at least a 5-point lead. Virginia’s race is in double digits, with incumbent Mark Warner beating GOP operative Ed Gillespie by at least 10 points.